The name has stuck. 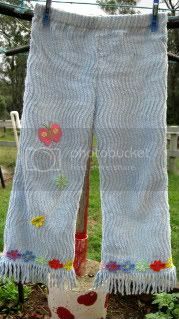 Pants made out of chenille are called 'Dunnyruggers'. This pair has some pockets on the back made out of vintage sheets. I'd love to show them off but I still don't know how to upload 2 photos at a time which is very frustrating as I'd like to start doing some tutorials just to give a little back to the community and help anyone new to sewing.